If you use Google Docs and Microsoft Office, you'll appreciate the new Outlook sidebar from Mainsoft. Called Harmony, and currently in beta, the sidebar lets you share, e-mail, download, upload, and edit your Google Docs right from your desktop using Outlook 2007. Harmony features drag and drop functionality to send documents via e-mail, upload a new file to Google Docs, or just view a Google Doc right in Outlook. The Harmony sidebar also travels with you, so when you open up a compose message window, the sidebar appears there, too, so you don't have to navigate between the main Outlook window and the message window to use Harmony. To send a Google Doc via e-mail, you just choose the file from the Harmony sidebar, drag it into your message window, and Harmony creates a link to the Google Doc online instead of attaching it to the e-mail. When the recipient gets your e-mail, they click on the link and the document opens up on the Google Docs site. If the recipient doesn't have a Google account, they will be prompted to create one before accessing the document. Harmony will also give you the option to set editing or viewing permissions for your document before you send it through e-mail. By default, Harmony sends your Google Docs as a link, but if you prefer, you can have Harmony send an attachment by adjusting your options in the Harmony sidebar settings. If you receive a word document, spreadsheet, PDF, or presentation via e-mail, you can upload the attached document to your Google Docs account; to do so, you just drag the attached file into the Harmony sidebar. With Harmony installed, you can access both your Outlook and Gmail contacts from within Outlook. However, these lists are not synchronized or merged; Harmony is merely making the two contact lists available to you. This means you will see some duplication if you have the same contacts on file in your Gmail account and in Outlook. Once you have your documents filtered, you can organize the list by clicking on the arrow on the top right of the sidebar. This lets you see your documents organized by owner, title, or most recent modifications. Harmony also lets you see who has editing controls on a particular document or folder by clicking on the sharing icon (the little hand). 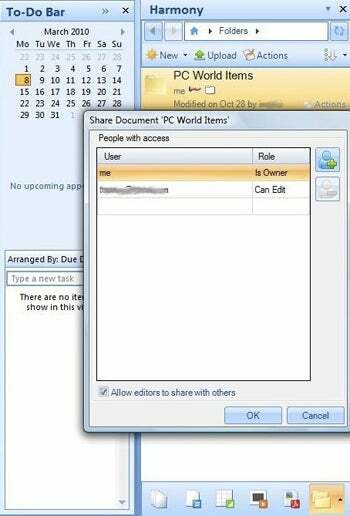 This will open up a pop-up window where you can add or delete document permissions for any documents or folders you own. The Harmony for Google Docs sidebar also features a search function to help you find your documents instead of scrolling through the list. Harmony lets you create a new Google document, but you will have to drag it into Outlook or open it online before you can edit it. Dragging a document into Outlook for editing will open the corresponding Microsoft Office program such as Word or Excel. But, due to the way Google Docs works, you will have to convert your files back and forth from Microsoft formats like '.doc' or '.xls' to Google Docs' proprietary formats. Google Docs does allow you to upload and store '.doc' or '.xls' files, but this functionality does not work with Harmony. For most files, conversion to Google Docs shouldn't be a problem. But if you have a heavily formatted document in Microsoft Word format, you may want to see what it looks like in Google Docs before sharing it through Harmony. Harmony is an interesting addition for Outlook users who prefer to use Google Docs for online document collaboration and storage. Mainsoft's new sidebar also plays nicely with others, and in my tests, I didn't see any conflict issues between Harmony and Xobni--another popular Outlook sidebar. Harmony is available today for Outlook 2007, and Mainsoft says it will be coming out with a version for Outlook 2010 when Microsoft Office 2010 launches in June. The company is also looking at creating a version of Harmony for Outlook 2003, as well as the upcoming Outlook 2011 for Mac. The current versions of Harmony are available for free, and Mainsoft says an enterprise version is also in development.